The meeting was called to order at 8:36 by Commissioner Borner. Commissioner Berry and Carlson were present. Commissioner Carlson made the motion to approve the agenda with an amendment to “add devices requested by the Commissioners for separation of work and personal computers”. Commissioner Berry seconded the motion. Commissioner Berry made the motion to approve December 31, 2018 Minutes and the January 2, 2019 minutes with the amendment to add the names of the Elected Officials that were sworn in on the January 2nd minutes. Commissioner Carlson seconded the motion. Being that it was the 1st of the year and a short week, none of the Commissioners went to a Board meeting so there is no information to share. County owned property not in the FEMA mitigation. Commissioner Borner would like to check on some property that is County owned and see what can be done with it to either use or be sold. Central Common’s maintenance issues. The Commissioners want to stay on top of this and hire an Engineer to look at it. Wells Fargo. Commissioner Berry still has not heard anything back from them but will call them again today. Bids for Extension Office. Commissioner Carlson is going to do a walk through with the County Agent to get the specs together. Storage in Courtroom. Clerk of Court Halverson is having someone come in and look. Steps at the Courthouse. There was a message left for Fred Winkler. Commissioner Borner will call him again. Damaged wiring on Courthouse. Commissioner Borner had sent the bids to MACo and they will be covered. Also the windows at the Commons will be covered. Director of Technology gave the Commissioners quotes on a system for them to separate County business from their personal computers. Ms. Jett told the Commissioners that the boiler room steps in the back of the Courthouse also need fixed so we will add that to the list of steps that need done. MT Boiler was here on Saturday and Midland Mechanical is coming today to look at the registers in the Courtroom and see what needs done. If plugged they will have to do the registers in sections. Keys for Commons were discussed, Ms. Russel cannot get to looking at the locks anytime soon. We think the only locks that need replaced are the Thimble and the Food Bank. Plumbing is done at the County Complex. Ms. Jett will contact 3 local contractors to fix the floor. There needs to be a master list of all local contractors. There is a School Board Meeting on the 14th of January 2019 and then we will find out about the mower/snow remover. Road and Bridge Supervisor Stockert and Secretary Kenner gave their weekly report to the Commissioners. DES Coordinator Fisher, Jim & Donna Pedrazzi, and Joe Vescovi were present. Mr. Pedrazzi said that they do plan on dedicating there little portion of land to the relocation of #4 Road but wants in writing how the County is going to protect them. Commissioner Carlson said that building a brim would bring liability back to the County. There are ways to shore but we need to make sure there is no adverse impact by work done by the County. Mr. Stockert said that Conoco Phillips will have nothing to do with repairs and if the County touches it, it’s on us. Mr. Stockert is waiting on the DNRC to start the Leske property and they might have materials that can be used to help fix the problem. There is a DNRC meeting January 10 and he is going to talk to them about it but will need a commitment from the Pedrazzi’s to use the land. Mr. Pedrazzi said they just want it in writing what is going to be done to protect them. Mr. Vescovi asked if the Army Corps of Engineers have been contacted. Commissioner Borner said it will be discussed at the meeting. (?) 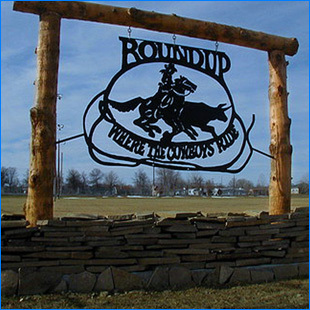 Commissioner Borner also said that Roundup Reach is also meeting on January 10, 2019 and she will make sure the Pedrazzi property is in the mitigation discussion. MS. Kenner said that after the meeting on the 10, the Pedrazzi’s will get another letter from the County regarding the land and the plan for protection. Ms. Pedrazzi reminded everyone that they farm the land but the City owns it. Commissioner Borner said that the City does know about the plans but should be reminded. Mr. Fisher said that he is on the City Council and will address it at the next meeting. A draft letter to the public informing them of #4 relocation and possible flooding this spring will go on County websites. Mike Goffena entered the meeting. Mr. Vescovi visited with the Commissioners with a complaint regarding the work that was done on Cameron Road. Mr. Vescovi stated that it is an abuse of power by a Commissioners to get the road fixed when it is for her family. Mr. Vescovi said that it is a Sage Grouse Management Area and they are going to have to deal with the BLM. Commissioner Borner told Mr. Vescovi that the Commissioners do not tell Road and Bridge Supervisor Stockert what roads to work on. Mr. Stockert does what he thinks needs done. Mr. Stockert told Mr. Vescovi that Commissioner Borner did not tell him to do anything on Cameron Road and that it was his own decision. Mr. Stockert said that they are a year behind on road maintenance because of the snow last year. Commissioner Berry said it is so noted and they will do some research. Mr. Goffena told the Commissioners that he built 4 tenths of a mile of Allen Road and was wondering if maybe he could get compensated for some gravel. Mr. Stockert told Mr. Goffena that the County pays $1.00 a yard for gravel. Commissioner Borner told Mr. Goffena to get the numbers together and they would be more than happy to look into compensation. Mr. Goffena said that he thinks Mr. Stockert is doing a good job and so are the Commissioners. Road and Bridge Supervisor Stockert submitted the 2018 road report. The pump replacement should begin on 1-7-19 and weather permitting be done by the end of the week. Ms. Kenner submitted suggestions to make amendments to the policy manual. The new road grader after loan is paid off was not discussed and the Presidential Declaration disaster items were not discussed. Mr. Stockert wanted the Commissioners to know that the County got dinged in the Safety Inspection for not having a signup sheet and agenda for the quarterly Department Head meetings. Sheriff Lesnik gave his weekly report to the Commissioners. Ms. Lesnik told the Commissioners that he would like to donate to 4 entities that volunteered their time and equipment in the recent tragedy that happened in Musselshell County. The Commissioners thought that was a good idea and to take it out of the loss & indemnity fund. Mr. Lesnik will be writing letters of thanks to local businesses that donated to the volunteers. There is an interview. Mr. Lesnik would also like to check into new carpet in his office. Commissioner Borner discussed the Impound building and reminded Mr. Lesnik to keep it in mind. Mr. Lesnik thinks that to put it in the old impound lot is a safety concern and will look into other County owned property. Commissioner Borner told Mr. Lesnik to look for grants to pursue for future projects. Accounting Supervisor Angel and Shirley Marking met with the Commissioners. Claims dates were set for every first Thursday of the month except for July will be the seconded Thursday because the 4th is on the first Thursday. Ms. Angel told the Commissioners that they are waiting on reimbursements for many grants. And that there were no open grants at this time. The Auditor will be here the week of February 25, 2019 and the audits will be yearly. Ms. Angel thinks that newly elected Treasurer Hetrick is doing really well with the transition from Deputy Treasurer to Treasurer and there have been some changes already. A list of all County Credit cards were given to the Commissioners. DES Coordinator Fisher gave his weekly report to the Commissioners. Mr. Fisher let the Commissioners know that he did talk to Mayor Jones about the #4 Road re-location and it will be addressed at the next meeting. The appraisals from the next phase of the FEMA buyout will be on the 3:00 business for next week. Burning is open at this time. There is a Public Hearing January 14, 2019 at 11:30 for fees to go with the Burn Permits. Ambulance Director Solberg could not meet with the Commissioners due to an ambulance call. Musselshell County Treasurer Hetrick met with the Commissioners. The 3rd Quarter, quarterly reports were given to the Commissioners. Ms. Hetrick needs the Commissioners to sign forms for her to be able to do the investing for her position. They will suspend the rules at the 3:00 business to sign the forms. Dave Liggett and Barb Halverson were present. Item #1 to discuss and decide on hiring an attorney for probate for the re-location of #4 Road was tabled until we can get more information. Item #2 to Review the Renewal Application or 2019-2020 submitted by Montana Association of Counties was tabled to verify information. Item #3 to review the 2019-2020 PCT Renewal Schedule Acknowledgement Form submitted by MACo was tabled to verify information. The Commissioner will vote on hiring an Engineering Firm to look at the Mussleshell County Central Commons for structural issues on Monday January 14, 2019 at 3:00 business. Commissioner Carlson made the motion to approve and sign the 22 Encroachment Permits for bore crossings and parallel lines for various properties in Musselshell County submitted by Mid-Rivers Telephone Cooperative. (These have been approved by Road and Bridge Supervisor Stockert) Commissioner Berry seconded the motion. Motion carried. Commissioner Berry made the motion to review and sign the Inter-Local Agreement between the Montana Department of Justice, Motor Vehicle Division and Musselshell County. Commissioner Berry seconded the motion. Motion carried. Commissioner Borner let the Commissioners know that this is something new that is going to be happening yearly. Commissioner Berry made the motion to suspend the rules to address items that were not on the agenda. Commissioner Carlson seconded the motion. Motion carried. Commissioner Berry made the motion to appoint Patty Pfeiffer to the Musselshell County Elected Official Compensation Board. Commissioner Carlson seconded the motion. Motion carried. Commissioner Carlson made the motion to sign resolution 2019-8Authorizing Darcie Hetrick participation in the Board of Investments of the State of Montana Short Term Investment Pool and Authorizing the Execution and Delivery of Documents Related Thereto. Commissioner Berry seconded the motion. Motion carried. Commissioner Berry made the motion to sign the Non-Corporate Organizations and Associations Resolution from D A Davidson for Treasurer Darcie Hetrick and Deputy Laura Pollice. Commissioner Carlson seconded the motion. Motion carried. County Attorney Peterson met with the Commissioners to let them know that he is going to put a motion in the Courts that he is going to withdraw from representation of Musselshell County regarding DV 18-73.